I think one of the reasons art fascinates people is the way it allows you to see for a moment through someone elses' eyes, to get a new perspective. This goes for us artists too so I'm especially excited to bring you two very different takes on the same thing. Tina Mammoser is a friend of ours and very kindly invited Rich and I to share her holiday spot at Saltwick Bay for a weekend. When we went exploring, we found the wreck of the Admiral Von Tromp framed perfectly by black rock. Naturally, neither of us could resist so we agreed to work from the same image and publish our results together. Tinas' approach couldn't be more different - while I'm driving myself batty fiddling about with every pebble in the landscape, she gets straight to the heart of the matter. 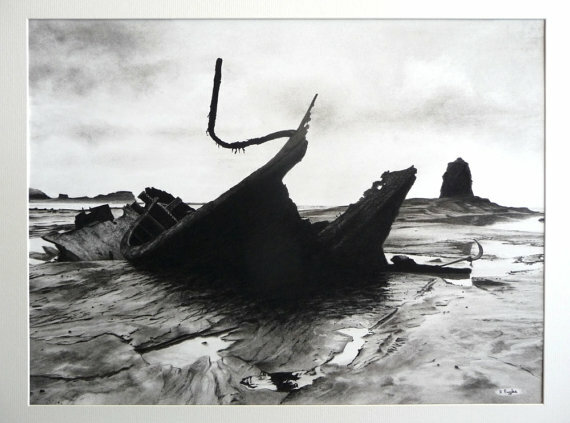 The focus in her picture is different too - Tina has used the strong lines of the wreck to frame the fantastic Black Nab to great effect. You can view Tinas' work including Rock and Wreck here . On the flip side, I was most excited about the looming hulk of the wreck and included Black Nab in silhouette to help place the wreck. 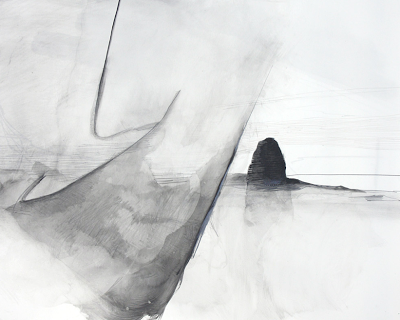 I used carbon pencil for the wreck itself so it's an even darker black than the surrounding rocks. You can see this piece over in my Etsy shop .